Turf managers have a tough job – soil compaction is the enemy - Alpine Services, Inc. Turf managers have a tough job. They are charged with maintaining athletic fields in spite of continuous use that often leaves them depleted. The few weeks each spring between end of school and beginning of summer represent a rare opportunity to perform deferred maintenance. It’s important for managers to make the most of that time. 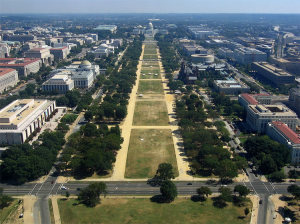 A study of the turf on the National Mall in Washington, DC, published by the National Park Service concluded that one deep aeration had the equivalent effect of three fertilizations on a grass field. The study documented the detrimental effects of soil compaction there. Soil compaction is the enemy of athletic fields, too. When we re-grade a typical high school field, we don’t hit “soft” dirt until we go down 11-13” below the surface. That is how deep the compaction penetrates. This illustrates how ineffective plug aerators that only penetrate the surface 1-2” are. Proper aeration must go 6-12” deep to fully address soil compaction. We have found that a combination of aerators works especially well. We typically first use a shattertine that goes 6-7” deep followed by one that goes 3” deep. Both machines break the soil loose; the first leaves a ½”x7” gash in the surface, the second leaves a hole that is about 1½” across. It usually takes 3 passes with the deep tine and 2 passes with the shallow tine to sufficiently loosen the top layer. The result is a loose surface that has holes available to receive compost, compost tea, fertilizer, seed, etc. When we examined fields treated in this manner 6 months later we found that the gashes were invisible on the grass surface but were still clearly defined just below the sod. Furthermore, the holes were filled with white roots which indicated that the roots were going into the holes for oxygen – proof that the aeration had done exactly what it was supposed to do. By the way, the field we examined had been rolled three times with a 12’ wide roller after aeration which showed rolling does not close the holes, it simply smoothes the surface. Each fertilizer manufacturer has its own plan for maintaining fields via a 12-month program. However, we have found that most soils are low in humus and address that issue first before adding fertilizer. It seems to us that we get better results if there is compost in the soil before we fertilize. The aeration program, as outlined above, yields a soil surface that is ready to receive humus since there holes and slits in the surface. The humus is applied via large top dresser to a usual depth of ¼” (or ½” if the soil is bad). Another good combination is an application of compost tea and Actosol to increase soil microbe activity. Then the Airavator is used again to mix the humus into the soil; a defined humus layer on top of the soil gives negative results. Overseeding is another viable option at this time. Soil humus aids the fertilizer program, and improves the soil structure at the same time. This is important since the window of opportunity to work on a field between seasons is narrow, and this aeration/fertilization operation usually takes only a day. Several necessary maintenance operations are accomplished quickly, the field will have a few weeks to recover, and the job is done right the first time.